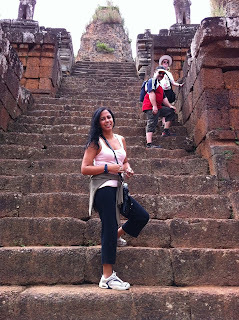 In early November, I went to Siem Reap. For those of you that don't know, that's Cambodia. Since I'd been working in Singapore, I had the chance to talk to my coworkers about the best places that they've visited and Cambodia always seemed to be at the top of their list. In early November I went to see what all the hype was about. Getting to Siem Reap was an adventure. 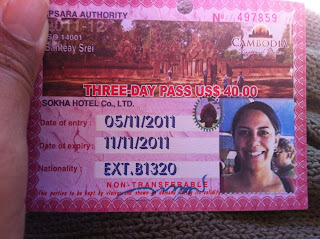 I'd been out a couple of nights before and hadn't taken the ID picture I needed for the visa on arrival. Further, I was leaving for Kuala Lumpur via bus from Singapore since all the flights to Siem Reap were either really expensive or booked up since there was a public holiday the following week. After taking my ID photos at a booth, I settled in for a few martinis, before scrambling home to pack and catch the bus. The bus ride to KL was a piece of cake, since I slept most of the way. After arriving in KL, we took a cab to the airport and with no time to spare boarded the plane to Siem Reap. Ever seen the show "Amazing Race"? Let's just say, my friend and I would've won had that been one of the challenges. Once in Siem Reap, I was impressed to see a modern, beautiful airport. It reminded me of Hawaii. Acquiring a visa on arrival was easy and I was on my way to the hotel. 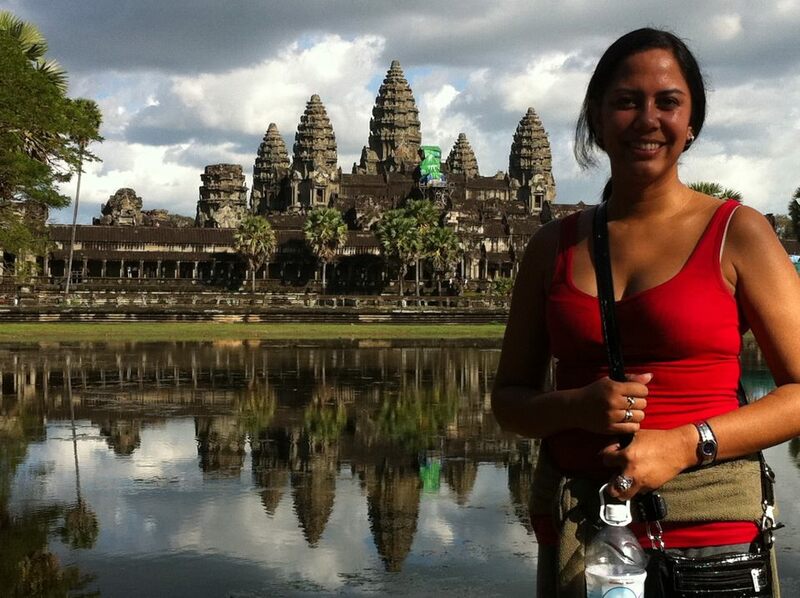 After a quick nap, I was ready to see what Angkor Wat and all the temples were all about. Armed with my 3 day ticket (i.e. cost $40 USD), I had no idea how much fun and hard work (i.e. we did a lot of climbing, but you don't have to) seeing all the temples would be. 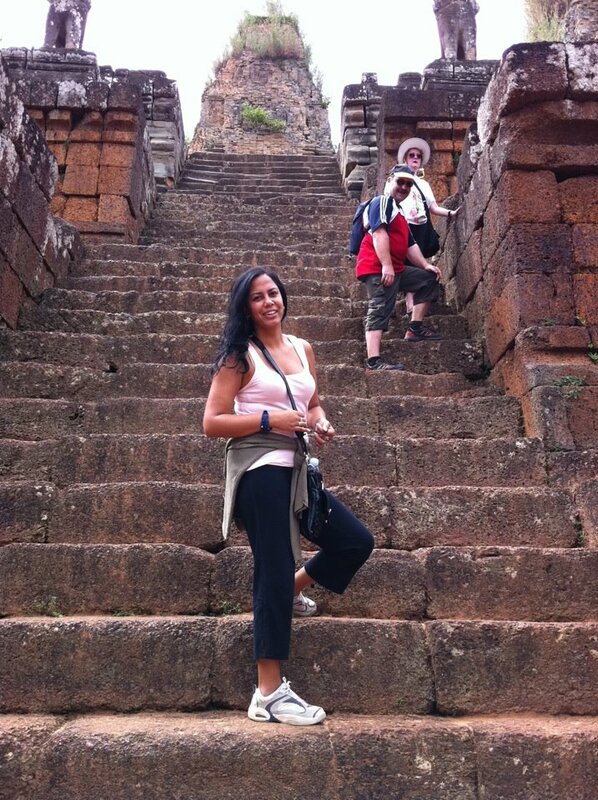 If you've never been to Siem Reap and you have the chance, you MUST see the temples. The architecture is amazing and I'll argue with anyone that says that "they're all the same". Each temple is unique and the craftsmanship is amazing. Nature has affected some of the temples (i.e. think the temple from the "Tomb Raider" movie with Angelina Jolie) with tree root growth etc., but these monuments are still amazing. I know the word "amazing", is over used - but they are AMAZING. Hire a tuk tuk driver - Some of the temples are spread out and depending on how many days you want to spend, the driver can recommend which temples to group together and routes to follow. Further, the driver will know where you can eat lunch and scope out the best sunrise and sunset. Pace yourself - These temples weren't built in a day and there's no way you're going to see them all in one day. Wear comfortable and appropriate clothing - If you're going to go into a special area of Angkor Wat, you have to have sleeves on. I'm not sure if you'll be able to get in with shorts or a shorter skirt on. I wore long paints and a tank top. I had a long sleeved sweater around my waist, just in case I needed it --- and I needed it for the special area of the temple. If you're not dressed properly, they won't let you climb the stairs. Wear underwear, especially if you're wearing a skirt and climbing - Trust me. No one wants to see you. Wear a shirt - You're not in your house or in your backyard. These are temples. Bring US dollars - If you don't have US dollars, you're only hurting yourself. I couldn't tell you what the Cambodian currency is, because I never had a need to touch it. Souvenirs and restaurants use the USD. Don't be shy to eat in Cambodia. The food is great and since it caters to tourists (i.e. Pub Street) there are plenty of choices! 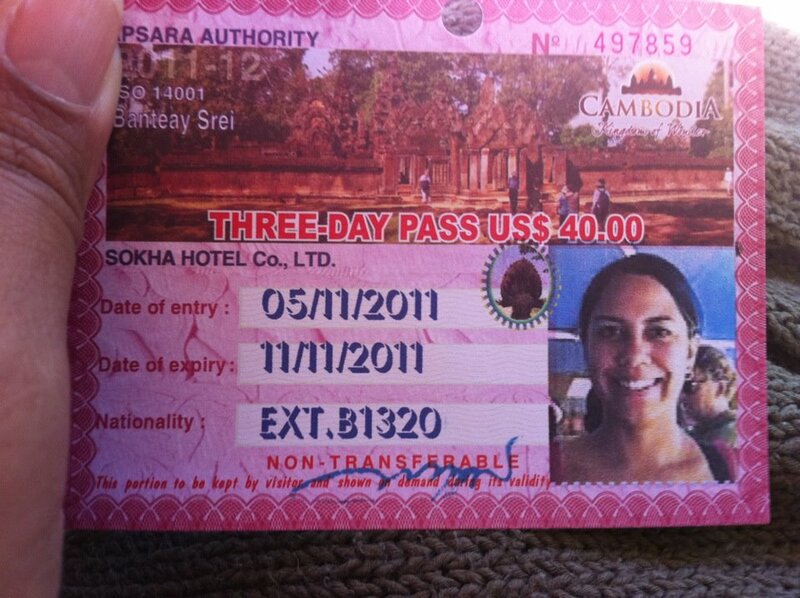 For a hotel, I stayed at the Empress Angkor Hotel. I'd recommend it. It's a great hotel. Closer to the airport and a little further from the temple, but the amenities are nice and the people are friendly. Come to think about it, just about everyone I encountered was very nice and welcoming. Oh and if you need a tuk tuk driver, I can recommend mine to you: Thy Tuk Tuk. 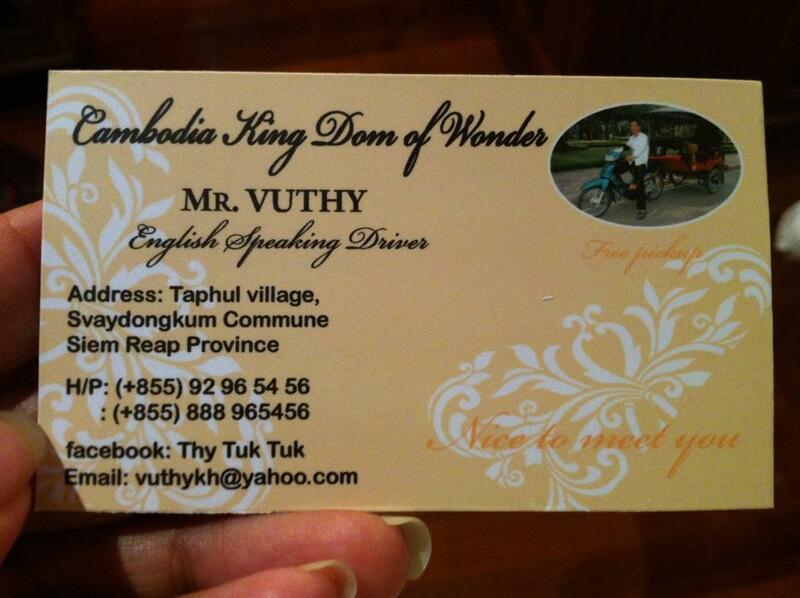 His email is thytuktuk1981@gmail.com and his card is pictured here.